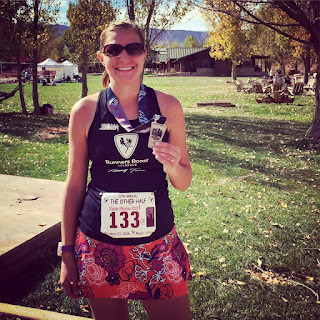 Here I am, WAY behind on blogging, as usual... Good thing winter is here and race season has slowed down, so I should eventually be able to catch up - hopefully. 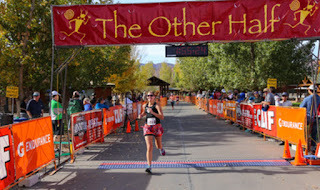 Nevertheless, here is my recap from The Other Half, Half Marathon which I ran back in October. 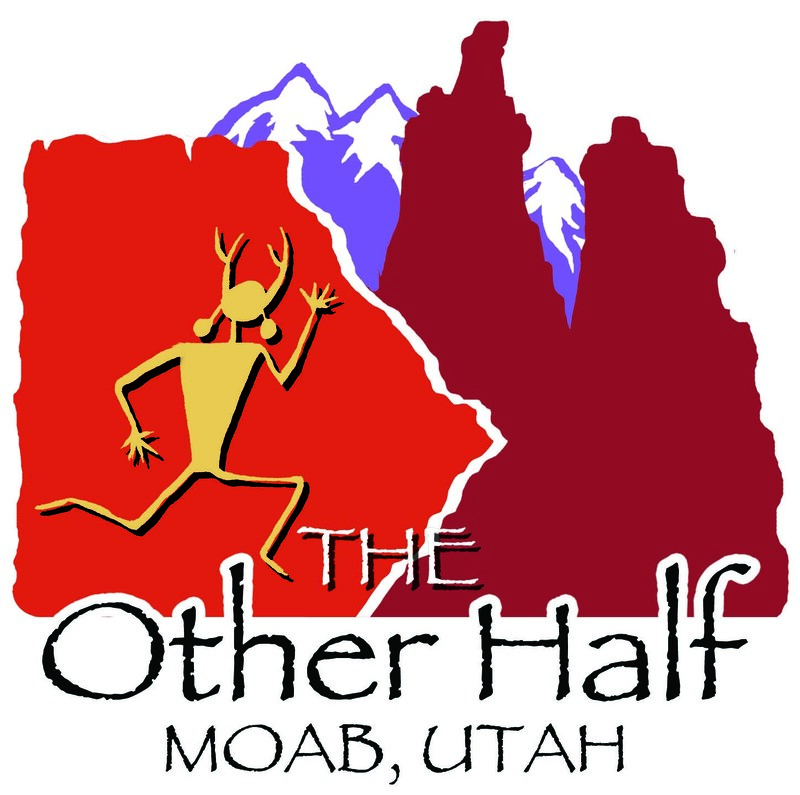 One of the best parts about living in Grand Junction is it's proximity to Moab...and thus, all of the cool races in Moab I get to do! My very first Half Marathon back in 2013 was Canyonlands Half, which takes place every March on Highway 128 - a scenic highway, mostly through a canyon, that runs from I-70 into Moab (not the traditional route - this one is a little bit longer, but more scenic by far!). Well the same people who put on Canyonlands Half also put on a fall race in October called "The Other Half". 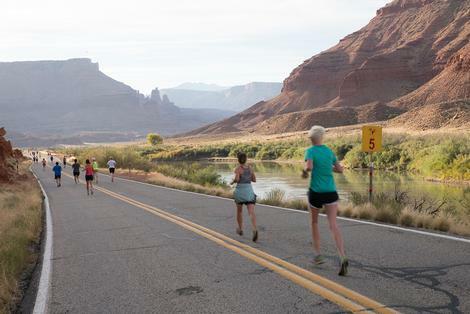 It's run on the same road as Canyonlands, but further north - or on "The Other Half" of it. The main difference is that instead of ending in downtown Moab, you end at the Sorrel River Ranch resort. I've wanted to give this one a try for several years now, especially since a lot of local friends say they actually prefer this one to Canyonlands - so I was really excited to FINALLY do it this year! On top of all of that, I will finally get the "triple crown" award this year for doing Canyonlands Half, The Other Half, and The Winter Sun 10K in one calendar year! My only reservation going into this one was how slow I had been feeling lately. I had tagged along on a few runs with friends - they were running easy and I felt like I could barely keep up. All of my months of trail running and training for ultra's left me feeling like I had NO speed whatsoever. Nevertheless, I figured this would be a good opportunity to assess my fitness level and to just enjoy the beautiful views. I ended up joining a bunch of local Grand Junction friends who had all rented a condo in Moab for the weekend. I met them up there Friday night, and then Saturday morning a few of us went into Arches National Park for a hike to Delicate Arch - one I've done a few times before, but never when there were this many crowds, it was pretty crazy! But beautiful nonetheless. 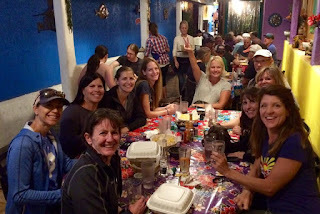 Saturday afternoon was spent relaxing and then we all had dinner with some other local runners that night before heading to bed for the race the next morning! We were up nice and early and headed to the gravel parking lot, which was located about 1/2 - 3/4 miles from the finish line. We hopped on a shuttle and headed to the race start. As we were on the shuttle I quickly realized that this was definitely going to be a hillier Half than it's counterpart (Canyonlands). Moab Half Marathon does a great job with race organization and when we got to the start line, there was, as with all of their races, trash-can fire pits, tons of porta-potties, coffee and hot chocolate. While we were waiting around for the start, I went and met David, a (fast) friend who I knew from my online running group (who I will be meeting up with in Houston next month), but had not met in real life yet, who would be pacing the 1:40 group. We took a quick picture and then I headed over to drop my warm layers at the bag check and head to the start line. It was probably in the 40's by this point, so still very cool, but I knew it would be great racing weather! Picture with David before the start! As I mentioned before, I really wasn't sure how this would go pace wise, so when the gun went off I just set out at a hard, but sustainable pace. I was hoping for under 2:00, but with the hills, I really wasn't sure. As always with big races (there were about 1000 runners), Mile 1 was a little slower than I wanted as I wove in-and-out of people trying to get into a good rhythm. I also stopped for a quick picture (the only picture I took on the course), and ended Mile 1 in 9:09. After that, I managed to get into a nice groove over the next few miles, running a bit faster than I had expected - 8:23, 8:20, 8:18, 8:37, 8:33. The one photo I took along the course! Mile 7 was when the hills started. And they were tough! Mile 7 was an 8:53, Mile 8 was the longest, toughest hill, and I ended up with my slowest mile of the day in 9:43. After that, I did my best to just hold on as best as I could, running Miles 9-12 in 8:55, 9:04, 8:36, 9:17. Finally, after Mile 12, it is all downhill to the finish! It's a good thing too because I was DEAD by this point. David, who had been pacing the 1:40 people, said he would come back and run me into the finish, so I was waiting to see him, which I did with about 1/2 mile to go. He was super motivating and I did manage to pick my pace up a fair amount, running Mile 13 in 7:57 - my fastest of the day. As I entered the finishers shoot, I gave it all I had left and finished the last tenth of a mile at a 6:46 pace, and finishing the race in 1:55:02. Definitely not my fastest Half, but my first hard effort in a race in a long time! And with the amount of hills on this course, I was very happy with this time! David running me in for the last 1/2 mile. Weather: Started in the 40's, ended in the 50's, but the sun was out and it felt HOT by the end. After I finished I jogged back around and watched as a lot of my friends came through, snapping some pictures of everyone. Then we relaxed in the Beer Garden for a bit while waiting for results and age group awards. We all got a picture together before we all made the Death March back to our cars... You know how I had mentioned that we parked about 1/2 - 3/4 mile from the finish area..? Well we had to take a dirt trail that seriously felt never ending, and which we ended up getting lost on and having to backtrack. It seriously felt like it took us FOREVER to get back to our cars! Once we finally made it, we headed back to Fruita where we all had a late lunch before heading home for the day! 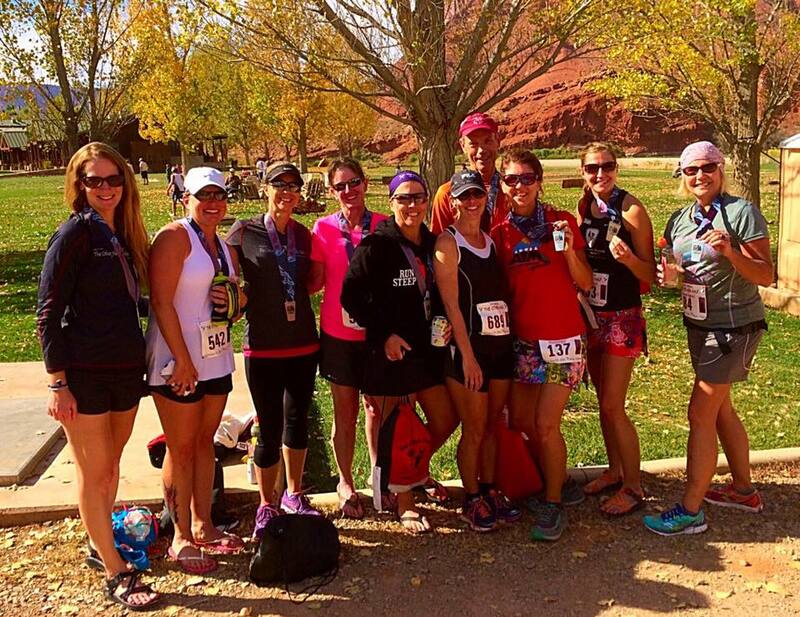 Most of the Grand Junction runners! 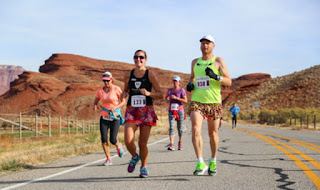 Overall, I did really enjoy this one, especially the social aspect of staying with friends, enjoying time in Moab for the weekend, and just another great event put on by Moab Half Marathon. This organization really does a great job putting on events - everything is so well organized and thought out. The courses are closed to traffic and the views really can't be beat. I wish I could have gotten some more photo's on the course, because it really is beautiful! Now, as far as this race being better than Canyonlands?! It's a tough call. 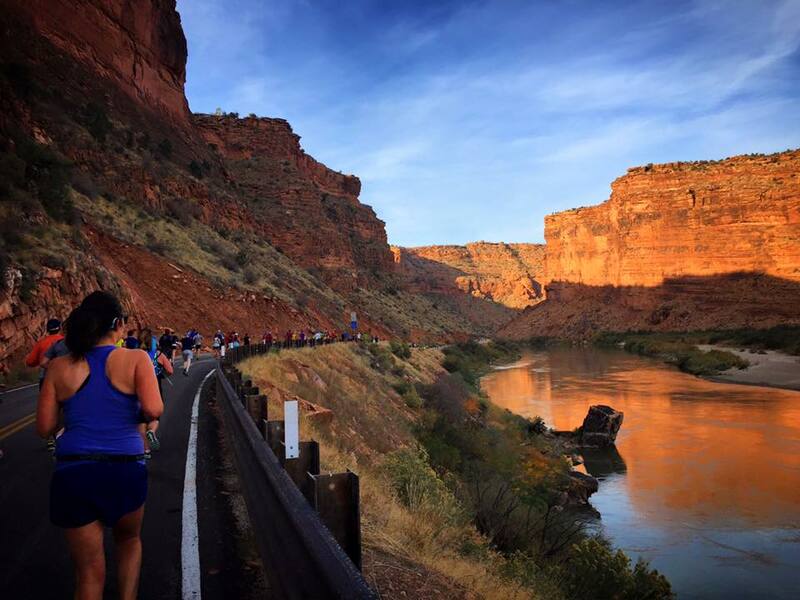 On one hand, Canyonlands will always have a special place in my heart because it was my first Half Marathon. I also do like ending in downtown Moab, where you can easily walk to various lunch spots, and Canyonlands is an easier course as it only has one major hill, as opposed to the many hills in this one. But, I did really like this one as well. 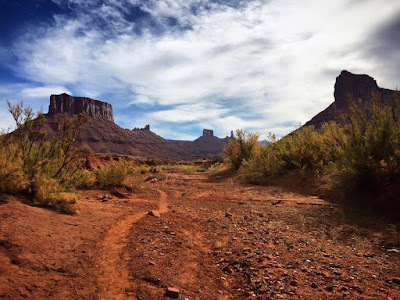 The views were great, and offered a little more variety than Canyonlands (Canyonlands is in the canyon the whole time until you get into Moab, whereas this one starts out in a canyon, but opens up with gorgeous views of Fisher Towers and Castle Valley). 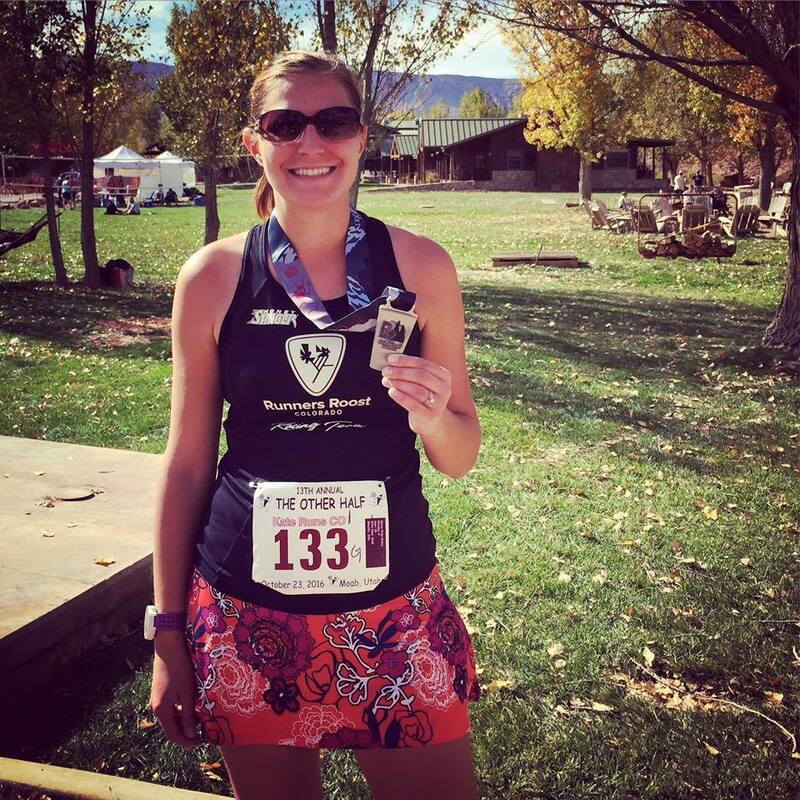 I think it's a toss up - they are both great races and great Half Marathon options. With Canyonlands being in the Spring and this one in the Fall, I just recommend doing both! I love love love Moab and this general area of the US. 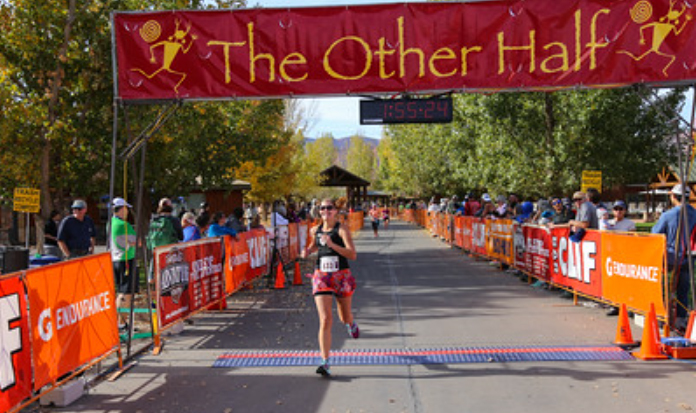 I'm dying to do both the Canyonlands Half and the Other Half. One day!